Most of the time navigating around Australia has been fairly easy. We have used a variety of paper maps and two digital navigation aids. 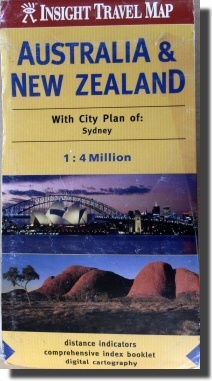 For outline planning we used the 1:4,000,000 single sheet Insight Travel Map of Australia & New Zealand . On this map we marked our initial selection of places to visit with a number that cross-referenced to a small note book. 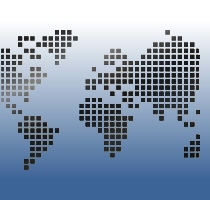 As each person we met suggested new places to visit we added their suggestion to the map and note book. (We quickly learnt to add the name of the person making the suggestion, and their vehicle registration number, so that when we met them again (often months latter) we could assure them (by name) that we had followed their advice). One of the first people we met in Brisbane made 96 suggestions, nearly all of them excellent. Many places (the Gibb River Road for example) were recommended by dozens of people. We soon learnt to be wary of suggestions from people obsessed with either fishing (more than three fishing rods on the bonnet and a boat on the roof) and/or with extreme off-road driving (sand-mats, a safari jack, winch, mud covered front lights and four spare wheels). The weather (in February) determined that we should first head south (where it was cooler) and later head north when it was dryer. You can see the resultant route here. The alternate colours each represent one month. To help plan our progress around Australia we created a very simple spreadsheet with the main towns and the most direct road distance between them. Given a start date of 2010-02-05 and a projected end date of 2010-10-01 this gave a daily average of 84km per day. Of course we did	not drive directly from one big town to the next. In practice we drove about twice the direct road distance. The actual figures ranged from about 183% to 207% of the direct road distance (Remarkably consistent given the wide variety of Australian terrain). For some areas (the Gibb River Road and Cape York for example) we bought local guide books with very detailed what to see and where to camp sections. MAN is equipped with a GPS enabled netbook computer in the cab. This runs a version of Windows that allows two navigation programs to be run simultaneously (each with their own GPS sensor). The two extremes of navigating in Australia were where the two digital navigation aids came in handy. For navigating in cities and towns we used Odyssey Navigator Version 2009 R5.8.14 from TWIG Solutions. 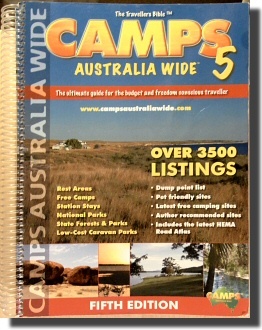 In towns this worked well and was a great help in finding camp sites in places like Sydney and Melbourne. However it also "worked" in the outback where it sometimes gave very bizarre advice. 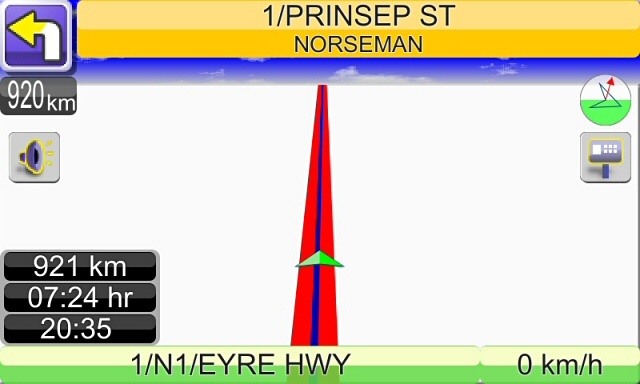 Below Odyssey Navigator is correctly suggesting that the next turn is in 920km when crossing the Nullarbor. 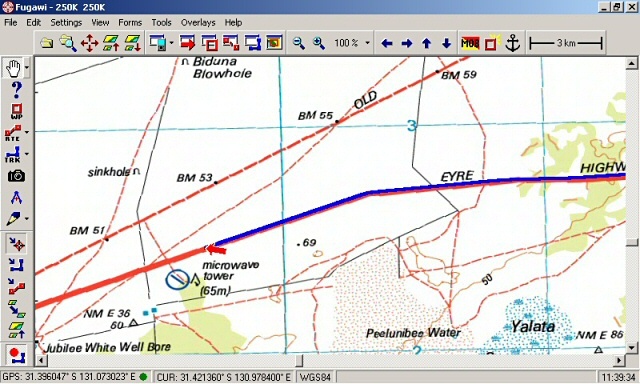 For help with navigation in the outback we used Fugawi Software with Geoscience Australia's NATMAP topographic maps that cover the whole of Australia at 1:250 000 scale in ECW image format. This seems to be the most authoritative map you can get of Australia but it is still many years out of date.